Things go the way they go, as opposed to the way I’d like them to go. Very often what is in any situation is in opposition to what I would prefer−and both are most likely okay; full of their own truth. And so here I have opportunity for a mandorla. What might I discover in a specific situation by holding the two together for a bit? What might I see and learn in the overlap of the two circles−which in the overlap itself is the teaching mandorla? The example is my mind and heart in some proposed work with a favorite client in Oklahoma. My mind wants it finalized, adding nicely to my year. My heart desires to hold the moment and trust all will be okay. And maybe for now my learning, and holding, is in the simple recognition of the mind-heart mandorla. This overlap (tension) is, I suppose, Creative Presence. As with any two sides to any one issue−seeming opposites−there is tension. It just may be that this overlap of tension is when we are at our best with Giving. And here lies the paradox with Skill 5, the skill of Giving. This skill is about giving in and through our work at all levels. At the core of all brands of giving is listening. In the mind circle, listening is at the surface focusing on outcomes. In the heart circle, listening is at the source of what’s most important to you. You’ve heard it said, “It’s not personal, it’s business.” You’ve also heard it said, “The heart wants what it wants.” In the mind circle is the timing aspect. Once you’ve done your part, you expect an outcome in return. The heart circle wants to trust the process and desires freedom in giving−a brand of presence that is not distracted by the sometimes trivial pursuit of the mind. As the two circles collide, we are presented with one of the most troublesome challenges, waiting. 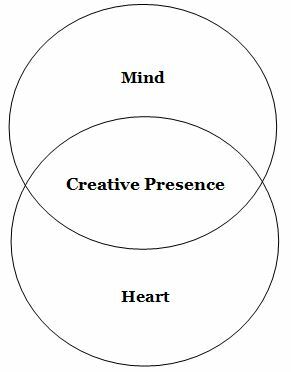 If you can bear with the overlap of the two circles, hold it long enough, the mind and heart begin to push you into the necessary Creative Presence. So, holding this overlap as best I can I find myself carefully reviewing how I can give in my network at a deeper, more contextual level; hopefully taking proper advantage of my waiting. What is an important issue where you need to create a mind/heart mandorla and enter your Creative Presence? This entry was posted in Giving, Presence and tagged 21st Century Leadership Skills, Conscious Waiting, Creative Presence, Giving, Presence by Jeff Brunson. Bookmark the permalink.